Family Review Network presented me with the opportunity to review Little Star by Anthony DeStefano , and I jumped at the chance, not only for what I said above, but because it sounded like a great Christmas story. The smallest, loneliest star in the sky, Little Star, is the only one to understand what the king was about to bring to the world. 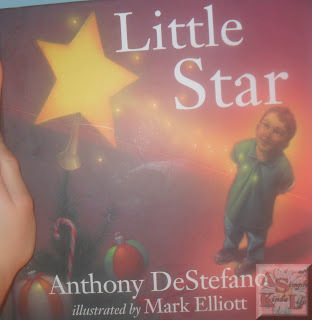 But what can Little Star do for him? I'm impressed with this book. I never heard of any story like this. Who knew the reason why the stars go on top of our Christmas trees?! I sure didn't! 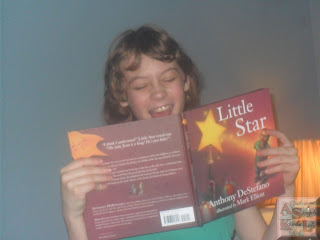 As you can see above, my daughter had a grand time reading this book! (She is a tad bit of a ham though!) She was shocked why the star goes on top of the Christmas tree too! The story delighted us both and brought some tears to my eyes. I truly enjoy Christmas stories that focus on the true meaning of Christmas. I'm sure this will be a book we read in our home for many years to come, not only to my children, but to my younger cousins, nieces and nephews, and friends' children. It's a great story! Disclaimer: This post was written for Family Review Network & Little Star who provided the complimentary product for review in exchange for my honest opinions. This looks like a great book. My 7 year old has been asking what our new Christmas book would be. This sounds like one the whole family would love. Thanks! !